Great Article! This is just what I have been looking for to share with teachers about digital content creation. Are you open to skyping sometime in the future with a group of educators in Colorado? I’m glad you found my blog useful, and I also really enjoyed reading your posts. I have just begun a doctorate looking at connected learning for teachers, and at my new blog linkinglearning.com.au I have written about Connectivism. 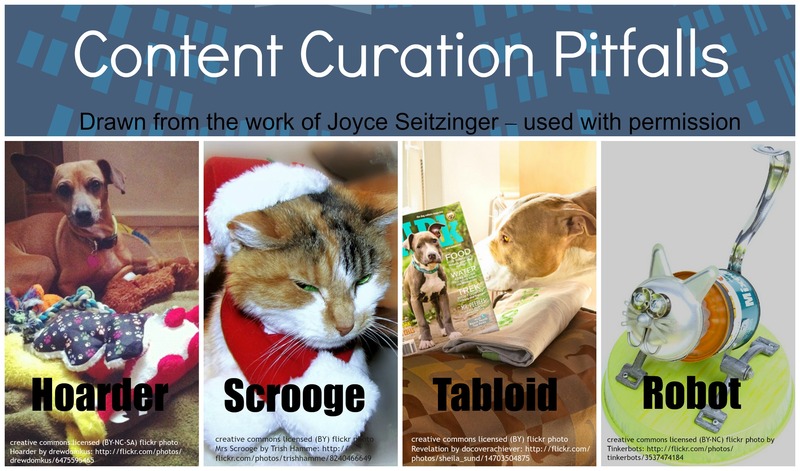 I also liked the descriptions of the different types of curation style to avoid that the wonderful Joyce Seitzinger gave me permission to adapt; they really ring true in so many cases, and I find myself falling in to all of them at one stage or another! Thanks for linking to my blog, and all the best with your studies :). Thanks so much for linking to my blog. I loved your post; so useful! Often it is difficult to see just how many jobs you are qualified for as a librarian, because we tend to play down our skills :-). This post is so useful! Thanks for linking to my blog, Nicole, I’m glad you found it useful! I really agree with the Clive Thompson quote you included in your post; sharing makes our learning so much richer, and the networks we build are so powerful. Best wishes with your studies, and thanks for including me in your PLN! :). I’m so glad you found my post useful, Lori, and all the very best for your studies! Being a content curator is such an important skill for teachers and students :-). Awesome article Kay! We at elink.io are trying to make it even easier for educator to curate educational resources that can help provide a unique learning experience. Would love for you to try it out and see if you find it helpful! Will definitely check it out, thanks for sharing, and I’m glad you enjoyed the post!